Situated in the once famous village of Bixad, where you can find a lot of mineral water springs, sulfuric pits, called mofetta, the pansion is an example of the Hungarian hospitability. 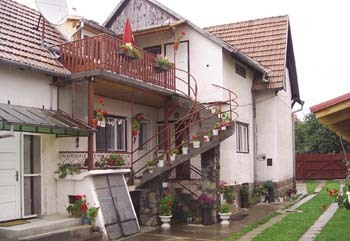 It is a family house adapted for receiving guests. It has very cozy rooms, small garden with a covered terrace. Every two rooms have a common, fully equiped kitchen, where the guests can prepare there meals. Across Bixad go several tourist pathways which lead to the most famous tourist attractions of the region (lake St. Ana, Balvanyos castle, etc.). Those interested in tourism can organise one day tours during which they visit all the natural attractions of the region.